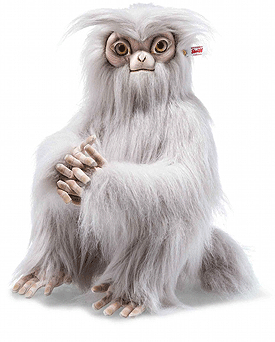 Demiguise by Steiff. A beautiful limited edition Steiff item, hand made in silver grey plush and carries the the famous gold plated Button in Ear and white ear tag. FANTASTIC BEASTS AND WHERE TO FIND THEM characters, names and related indicia are © & TM Warner Bros. Entertainment Inc. (s18) This product is not a toy and is intended for adult collectors only. FANTASTIC BEASTS AND WHERE TO FIND THEM characters, names and related indicia are © & TM Warner Bros. Entertainment Inc. (s18) The Demiguise is a primate-like creature that resembles a silver-haired orangutan with large, doleful black eyes. It has the remarkable ability to become invisible at will, and has precognitive sight, so the only way to catch it is to do something completely unpredictable. The Demiguise is fundamentally a peaceful beast, but it will give a rather nasty nip when provoked or feels threatened. Unfortunately for the Demiguise, its long, silky, silvery hair can be spun into Invisibility Cloaks, making its pelt highly valuable.